Conservation of forest communities in Estonia dates back to the first millennium A.D. Ancient Estonian believed in the spirits of nature and considered old forests to be sacred. Big oak and lime trees were considered to be sacred trees and people turned to them for help. It was strictly forbidden to harm those trees in any way. The first dated act of forest protection was in 1327, when Danish King Erik Menved forbade felling on three small islands in Tallinn Bay in order to maintain them as maritime navigation landmarks. Forests have mainly been used for the protection of marshlands, nature sites or landscapes. On 14th August 1910, the Riga Association of Naturalists rented Vaika bird islands, in order to ensure safe nesting opportunities for local birds and prevent the collection of eggs. Thus, the first nature conservation area in the Baltics was established. Today 1/5 of Estonia is covered with different protection areas. Among these, about 5% are strictly protected areas. There are 5 national parks: Lahemaa – the biggest, Karula – the smallest, Soomaa, Vilsandi and Matsalu. 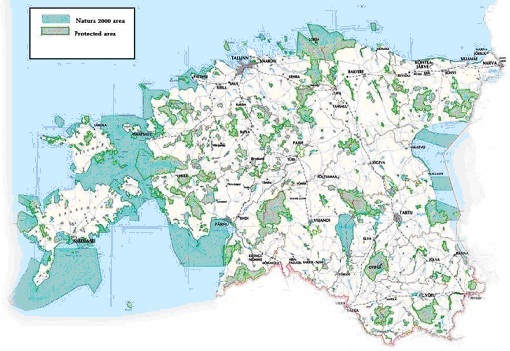 In 2010 Estonian Natura 2000 network consisted of 66 bird sites and 531 habitat sites of community importance. Most of the birds sites are also habitat sites and thus the total area accounts for about 30 % of Estonia.